Get down to Integrity today and take advantage of our Spring Truck Sale! Integrity Auto Finance has the best selection of nicer, newer trucks in the state of Oklahoma. We’ve got 2-door and 4-door, crew cab and extended cab, starter trucks and luxury trucks, and an outstanding selection of high-quality, heavy-duty work trucks. Check out the video below for details! Take advantage of our Spring Truck Sale, only at Integrity Auto Finance! We’ve got the best selection of high-quality used trucks in Oklahoma — half-ton and 3/4-ton work trucks, one-ton dualies. Check out this 2013 Ford F-150 Lariat! This 4×4 is completely loaded with heated and cooled seats, touchscreen stereo, off-road tires, LED lights on the front, and a bedcover on the back! This Chevy Silverado 1500 4×4 comes equipped with a 6L high-output Vortec Max Chevy engine — the same one you’re going to find in a 3/4-ton, and this is a half-ton! Black leather interior and awesome tires and wheels. This Ford F-250 is a 3/4-ton with a powerful V10, lift kit, brand new tires and wheels, leather seats, sunroof, and bedcover. And we’ve got heavy-duty diesel trucks — Cummins and Powerstroke! You won’t find trucks like these on any other Buy Here Pay Here lot in Oklahoma. Don’t worry about your credit — we are the bank! We’ll get you in the truck you want with payments you can afford! 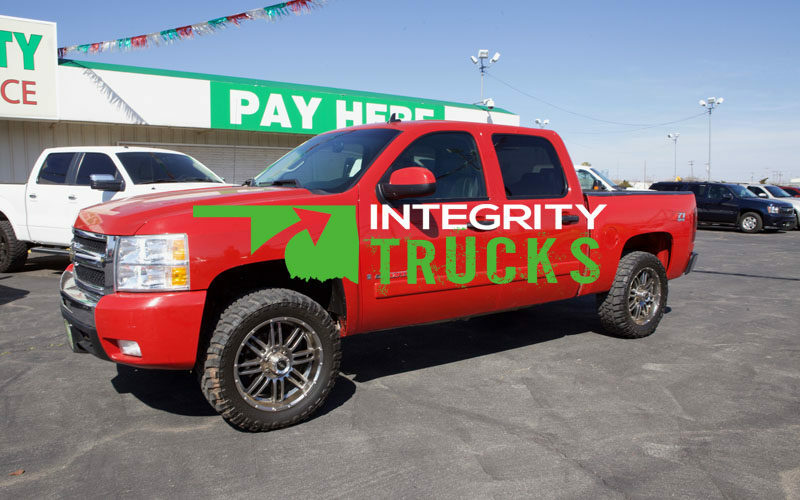 Check out our awesome selection of trucks at IntegrityAutoFinance.com, and get started with our Easy Finance Application!